A Catholic charity at work. 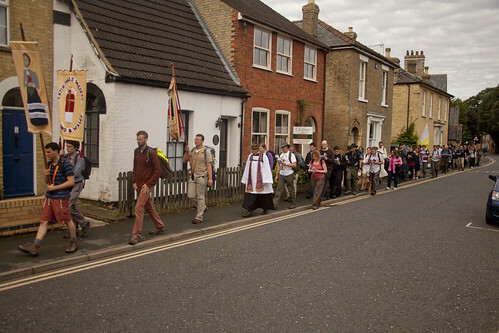 The LMS Walsingham Pilgrimage in Ely. 279. Sometimes it seems that our work is fruitless, but mission is not like a business transaction or investment, or even a humanitarian activity. It is not a show where we count how many people come as a result of our publicity; it is something much deeper, which escapes all measurement. 239. We do not need plans drawn up by a few for the few, or an enlightened or outspoken minority which claims to speak for everyone. It is about agreeing to live together, a social and cultural pact. The concern of a state agency or secular NGO is to get as many units of welfare delivered as efficiently as possible. There is something to be said for this approach, obviously, particularly in emergencies. But when a Catholic is confronted by a person in need, he is confronted by a person: a creature made in the likeness of God, about whom Christ will say 'as you treated one of these, you treated Me.' This has the result that Catholic agencies are often - and always should be - characterised by the development of human relationships, conversations, personal warmth. A prime example of this is given by Bl Teresa of Calcutta, Mother Teresa, and (among other things) it infuriated some of her critics, like the late Christopher Hitchens. She would spend hours talking to just one person. Was this the misallocation of resources? This kind of resource, 'talking to Mother Teresa', isn't something which can be rationed out in life-preserving mouthfuls to thousands, it is something which, under providence, she gave with total selflessness to those with whom she happened to be confronted. Is this kind of thing going to solve the world's social problems? We don't know the good God will draw from it. But in human terms, no: these problems will not be solved without the involvement of the state, because they derive from fundamental economic and social issues created and sustained by laws, regulations, and policies controlled by the state. That the Church can't solve these problems is no criticism of the Church, it is just the nature of things. What we can do is to bring Christ to people, whether it be by addressing spiritual poverty directly, or by giving a tramp a smile as well as a bowl of soup. The contrast between state efficiency and charitable human warmth is well worn theme. In creating the National Health Service, Anuerin Bevan famously said 'I would rather be kept alive in the efficient if cold altruism of a large hospital than expire in a gush of warm sympathy in a small one.' The small hospitals he had in mind were the ones created often by private philanthropy which the new NHS closed down in the hundreds. (The NHS inherited 2,800 hospitals from its predecessor institutions in 1948; today, for a vastly bigger population, it has 2,300.) Since then every charity has been exposed to the temptation to ape the cold altruism of efficiency, and Church institutions have often succumbed to this. In practice, of course, the efficiency can be lost along the way, leaving only the coldness. Related to this is another problem Pope Francis has picked out: of Catholics and Catholic institutions losing their Catholic identity. We all know about the Catholic charities which want to get government grants, or grants from secular-minded charitable trusts, and gradually change both their policies and their names to play down their Catholic identity: indeed, 'a Catholic charity' becomes one with a 'Catholic ethos', then a 'Catholic heritage', and then it gets forgotten altogether, even if it lingers in the pages of the Catholic Directory for a few more years out of sheer habit. It is clear what they are getting: money ('financial security'), contracts, a seat on various committees set up by the government. What are they losing? Their whole raison d'etre. Because these institutions were not set up as organs of the state, but as ways of reaching out in Catholic charity to those in need, and this means reaching out as Catholics. Excellent..I would love to hear your views on pacifism, voluntary poverty, distributism & stuff like that. It would be great to have a group/blog where we could discuss these things..
what about paragraph number 254?